Bring your boat and water toys for daily fun at the water’s edge in this lakefront home with a private dock and relaxing shade deck. The house has four bedrooms, a loft, and three full bathrooms. The recently remodeled kitchen is a cook’s dream. The loft is equipped with a TV, is the perfect spot for young children. Access to the loft is by ladder. 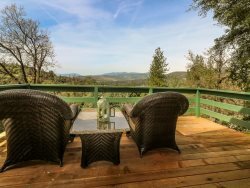 This home is a perfect location for your family getaway to Bass Lake and Yosemite. Amenities include: Internet, cable TV, clothes washer and dryer, wet bar. Bass Lake offers boating, hiking, fishing, and bicycling. The home is near the Pines Village area at Bass Lake, which provides restaurants, a general market, bars, shops, and a full-service marina with rentals for boats, jet skis, and other watercraft. The town of Oakhurst is about 7 miles away, with shopping, restaurants, wine bars, a brew pub, a movie theater, and a live stage theater. The Chukchansi Casino in Coarsegold is 18 miles away. Bass Lake is less than 15 miles from the southern entrance of Yosemite National Park.